There are lots of ways to update the look and feel of your home’s exterior. You could paint or get new shutters. You could even landscape. But one change you can make which drastically alters the look and feel of your home is changing your doors. For one recent customer of ours, changing the doors didn’t just mean getting a new front door. The Gunderson’s own a successful garage door company in Covington – American Garage Door. Given that they own a door company of their own, it shouldn’t come as a surprise that they recently upgraded their home with a beautiful new garage door. However, once the new garage door was installed, they quickly realized that their front and side doors not only didn’t match, but they also looked dated and worn as they were the original doors on the home. Oh, and their back door was leaking water too! As they began looking at new options for the front and side door which would accent their new garage door, they quickly realized that stock doors were not going to work and they would need a custom door designed for them. The Gunderson’s had something of a “tall order” to fill so to speak! In addition to needing to match the look and feel of their garage doors, their front door had an arch and sidelights which are not an easy combination to find. Additionally, they wanted a more formal look and feel. At first, they visited a competitor’s showroom before coming to us. 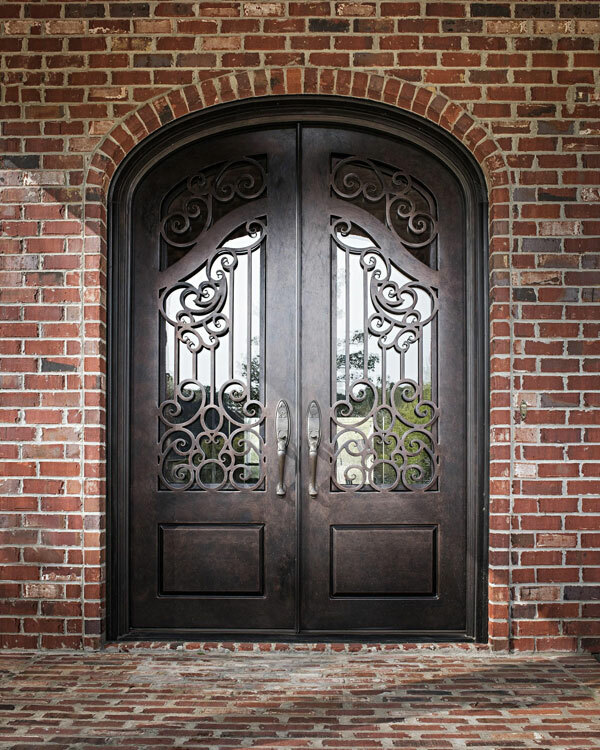 They looked at different types of doors and found one they thought they liked, but it didn’t come in the right size and the other company couldn’t custom order it for them. That’s when they came to us! 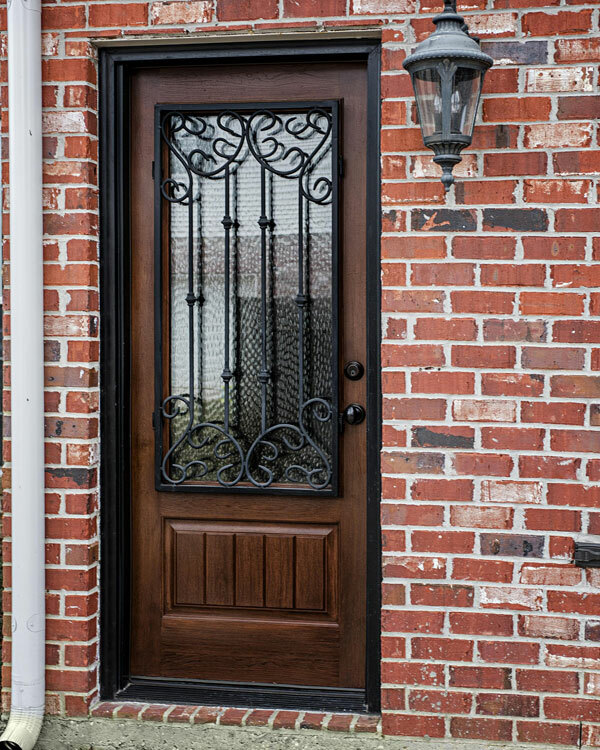 We started by browsing a few catalogs to get a feel for what they wanted and to see how they could design it a little differently with different options for accessorizing the door. And finally, we found the right design with a custom door. We added an iron scroll to match the garage door style as well as matched the color stain. Once the doors were ordered and installed, our installer even helped fix a problem where the door didn’t meet with with the tile on the interior of the house. This type of problem couldn’t have been anticipated ahead of time, but with a little extra work we were able to resolve the issue and the new doors fit perfectly in their home. According to the Gunderson’s, the best part was that we worked together to find the right fit to get the look and feel they wanted. The end result is it looks amazing..the side door looks exactly like the garage door! In fact, they’ve had people who drive through the neighborhood stopping to give them a compliment to show how they’ve changed the appearance for the better! If you’ve been looking online and can’t find the perfect door, stop into our showroom and talk to one of our helpful sales professionals. Most customers tell us that getting to see, touch and feel the hundreds of doors in our showroom helps them through the decision process, and our team will help get you a competitive quote on a custom door that is perfect for you!